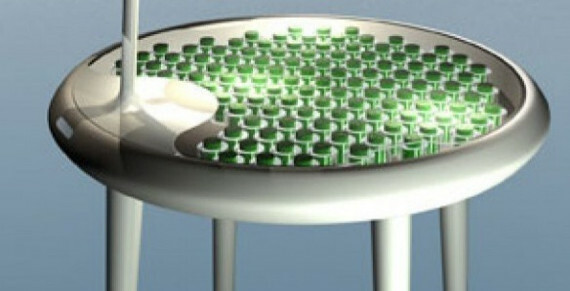 Alex Driver and Carlos Peralta's 'Moss Table' has won the People's Choice poll to be included in the Design Icons: Cambridge Innovation Festival exhibition at Anglia Ruskin University. Alex Driver and Carlos Peralta’s ‘Moss Table’ has won the People’s Choice poll to be included in the Design Icons: Cambridge Innovation Festival exhibition at Anglia Ruskin University (8-23 February). The interactive Design Icons exhibition, organised by Creative Front and staged at the Ruskin Gallery on Anglia Ruskin’s Cambridge campus, will showcase 20 of the most important products designed in Cambridgeshire over the last 40 years. Designed by Alex Driver and Carlos Peralta of the IfM’s Design Management Group, in collaboration with scientists, the table is a concept for a potential future application of biophotovoltaic technology. The moss produces energy through photosynthesis, which would be stored in a battery. Although it is currently unable to power the built-in lamp, scientists have been able to demonstrate that moss can be used to drive low energy devices such as a digital clock. Because the table is a “living exhibit”, it will only be on display from 8-10 February. Other products on show from 8 February include the Dulux PaintPod Roller System, Kenwood Juice Extractor, Prestige Traditional Kettle, Freudenberg Vileda Magic Mop II, SureFlap catflap, Sinclair C5 and the Sinclair ZX Spectrum.